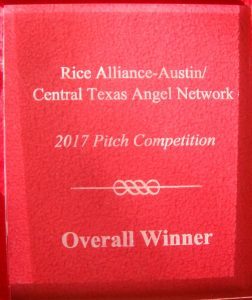 Austin, TX, January 25, 2017 – Well Beyond Care, an online caregiving matchmaker service that is disintermediating private duty care, won the first Rice Alliance-Austin Chapter and Central Texas Angel Network pitch competition on Wednesday night at the Alamo Drafthouse on South Lamar. With overall winner’s prize package is worth more than $100,000 including “in kind” prizes from Andrews Kurth, Capital Factory and other companies. Rice Alliance and CTAN picked ten Texas-based seed stage companies out of 67 who applied to present at the event. Jeffrey Fry, CEO and Co-Founder, came up with the idea for Well Beyond Care after caring for his ailing mom, who lived in Alexandria, Virginia for seven years. “First it is an honor to have been chosen to present with so many fine Austin startups,” Mr. Fry stated. “And to be selected the overall winner just gives testament to the pressing need to resolved the “silver tsunami” of geriatric care in the U.S.,” Mr. Fry added. “Being an engineer, I wanted to create something better than what’s out there. Together with my co-founder, Lauren Tarrant, RN, we created an innovative online platform that allows families to hire their own caregivers and resolve most of the pervasive problems in private duty care. This platform not only save families $10K to $30K in caregiver cost but families now can hire a caregiver of their choosing, that are matched to their needs, and are dependable, reliable, affordable, and available,” Mr. Fry concluded. Well Beyond Care, founded in 2014, has raised $310,000 in seed stage capital so far. The company is raising additional funds to build new features into its it platform including a mobile app and more administrative reporting. Project Balance has been contracted to develop this applications and the company is looking to launch their platform in May of 2017. Anderson Remplex: This Flower Mound-based startup created a product called ProROX to eliminate pathogens from food products for commercial kitchens and consumers. HipPocket: This Dallas-based startup created a better search and marketing product for real estate listings using machine learning, data and analytics. The company says it transforms how buyer and sales agents connect and consumers buy homes. Renovate Simply: This Austin-based startup created a home renovation platform for banks, credit unions and other lending institutions to automate the home renovation process and provide increased transparency and reduce risk. Cingo: This Austin-based startup provides the technology for companies to embed real time in app customer support in their mobile apps. Homads: This Austin-based startup created a marketplace for month to month rentals of 30 or more days. Sandbox Commerce: This Austin-based startup created a simply to use system that allows retailers to create a mobile app easily without any knowledge of coding. SigTrak – This Austin-based startup created technology for data extraction and analytics for microchip design. Rice Alliance – Austin Chapter aids entrepreneurs and investors alike, principally through educational events and workshops but also through mentoring, funding, partnership, and networking. The Austin Chapter was formed in 2003 as the successful Rice Alliance for Technology & Entrepreneurship initiative at Rice University in Houston expanded its footprint. Austin was an obvious choice and the Austin Chapter now claims an important space in the entrepreneurial community in the capital city. Learn more at austinricealliance.org. Central Texas Angel Network (CTAN) is the largest angel investing network in Texas, and the #1 most active single-chapter group in the nation (for 2015). It mission is twofold: To provide quality early-stage investment opportunities for accredited angel investors, and to assist entrepreneurs and early-stage growth companies by serving as a key source of funding, mentorship, strategic advice, and educational resources. CTAN was founded in 2006 by local investors and community leaders, who believed that early-stage investing could provide a meaningful return for investors while also spurring local economic growth. Individual members of the organization volunteered their time and expertise to review potential investments and assist entrepreneurs. Learn more at centraltexasangelnetwork.com.